10 Ways to Die in Yellowstone! Still, we are left with an impressive array of natural perils, the top 10 shown here with Robert Rath’s fine renditions of menaces that are ever-present… and deadly. James Wilkerson, 19, was drowned on Hellroaring Creek near its mouth on July 18, 1982. 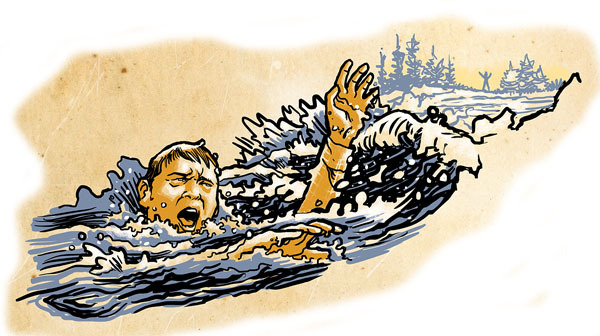 Wilkerson was attempting to ford the creek (known to be a nearly unfordable stream) to aid a female companion struggling in the water when he was swept into the nearby Yellowstone River. It had been a wet winter and the stream was running very high. Rather than use a footbridge a mile farther upstream, he decided to ford. The woman was swept to safety, but Wilkerson was flushed from Hellroaring Creek into the Yellowstone River. A friend remembers that Wilkerson looked back with a bewildered expression, and that was the last they saw of him. His body was never recovered. Six people have met their deaths by hurtling into the Grand Canyon of the Yellowstone River about 20 miles downstream from Lower Falls. The Tower area, with its beautiful columns, spires, pinnacles, and scree slopes that captivate viewers, has probably hypnotized several persons not watching their footsteps, thus becoming victims fof a fatal attraction. Robert Landram, 31, of Salt Lake City was one of these who fell into the Canyon, trying to get a better view from the high panoramic overlook. 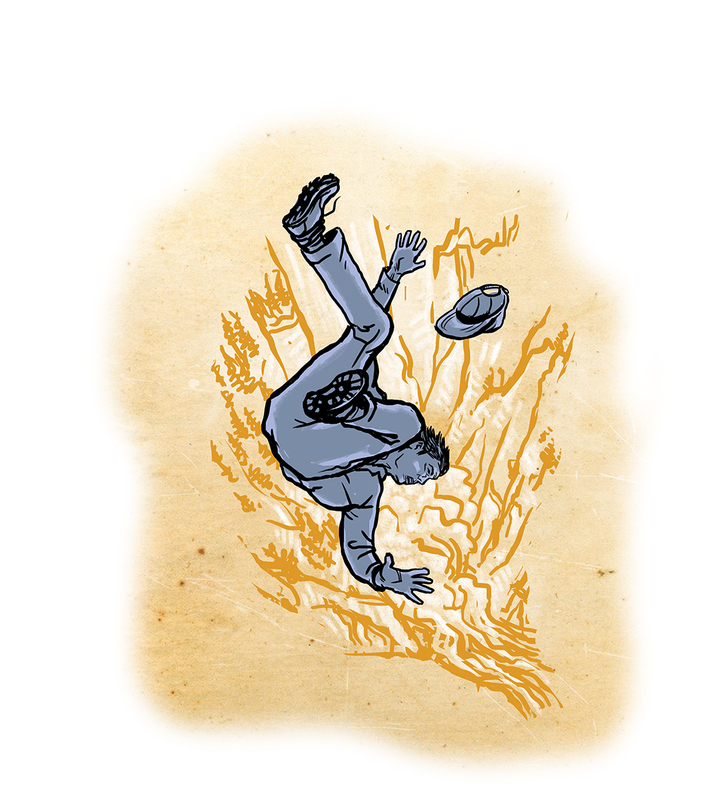 Landram died on July 9, 1955, at about 7:30pm, when he fell about 490 feet from a ledge at the stone wall near the tall spire known as the Needle. 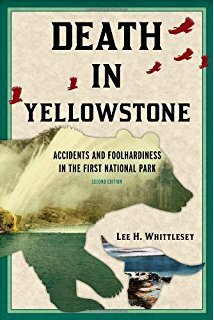 He went over the ledge, fell 130 feet and hit another ledge, then fell the remaining 360 feet into the Yellowstone River. His body washed downstream and was never recovered. On the evening of July 12, 1967, Brian Parsons, 20, of Nanuet, New York, an employee of the Yellowstone Park Company at Lake Lodge and a biology major at SUNY - New Paltz, decided to go on a late-night excursion with friends. It was his birthday. They drove some 48 miles to the Nez Pierce Creek area north of Old Faithful and hiked up the creek in near darkness. The imprudent group did not secure a fire permit nor did they even have a flashlight. Parsons and his friend, Ronald May, 18, of Cheyenne, Wyoming, wandered away from the main group to go swimming illegally in one of the hot springs. 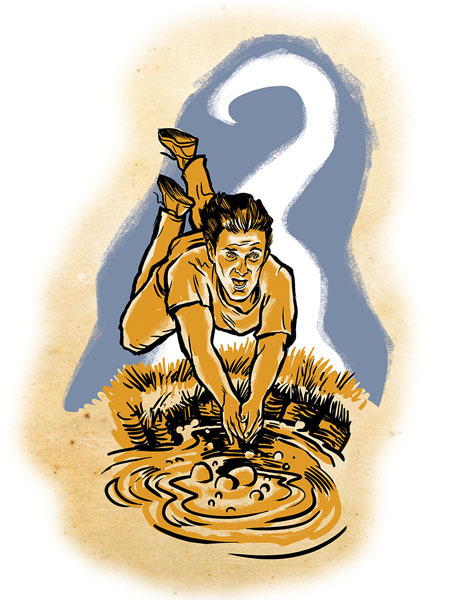 In the dark of around midnight, Parsons somehow fell or dove into a hot spring of around 180 degrees Fahrenheit. May attempted to rescue him and sustained second-degree burns to both of his legs. Parsons was covered with second- and third-degree burns over 90 percent of his body. He lived for some 12 days afterward in a Salt Lake City hospital but finally died. Because “he was greatly enamored of the outdoors and the creatures found there,” friends established a biology scholarship in his name, which has ever since been awarded annually at his university. In 1999, an elderly park visitor strangely froze to death in late May. He was Paul Hudson, 66, of Orlando, Florida, who died on May 26. Hudson and his wife, Phyllis, arrived that day at Artist Point, elevation more than 7,900 feet, late in the afternoon. They hiked up the Artist Point trail, and by around 5:00pm were hiking back to their car. Phyllis was a short distance ahead of her husband and noted that he stopped to talk with some other park visitors. She slowed her pace to allow him to catch up, but when she arrived at the parking area he was no longer behind her. She turned back to look for him and enlisted the aid of others when she could not find him. NPS rangers searched until midnight without success, and resumed the search at daylight. At 8:30am one of their dog teams located his body near Point Sublime, about a mile to the east. Perhaps Mr. Hudson became confused and walked east into the woods rather than west back to the parking lot. He died of exposure due to hypothermia. A foreign visitor was gored to death on July 31, 1983, in Hayden Valley because, according to the newspapers, he wanted to get his picture taken with a bison, a solitary bull. 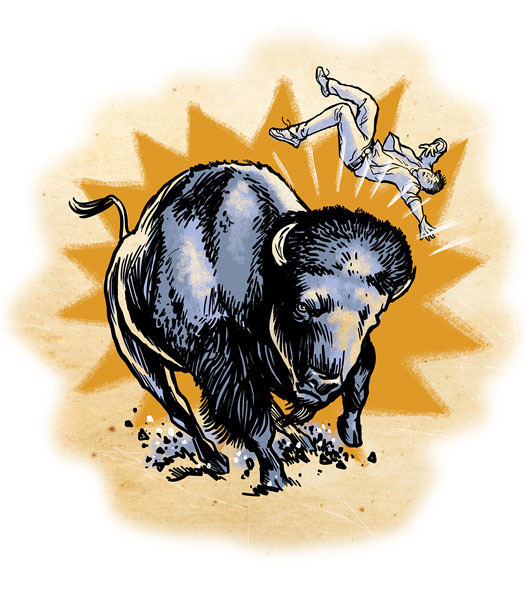 Alain Jean Jacques Dumont, 21, of toulouse, France, was having his picture taken about six feet from the buffalo when it charged and gored him, tossing him ten feet into the air. Robert Walker, 6, his parents and two sisters from Billings, Montana, were staying in the Fishing Bridge cabins on the evening of July 7, 1936, when one of the park’s legendary windstorms struck. Robert was playing outside of their cabin when the first gusts hit about 8:00pm. Deafening thunder and dazzling lightning accompanied the winds, which uprooted at least 176 lodgepole pines in the nearby campground. The Walker family became alarmed at the storm and ran from their cabin to find Robert lying outside. He had been instantly killed when a large tree came crashing to the ground and pinned him underneath it. research for the Wildlife Research Institute at the University of Idaho. Mountain lions are few in Yellowstone, but Felzien knew there were between 20 to 35 of the big cats in the northern part of the park, and had been tracking one large, radio-collared male in particular. On February 22, 1992, Felzien was snowshoeing in a deep drainage near the base of Mount Norris, wondering where his big cougar was. Whether he knew what was coming and tried to run away, or whether he was buried by surprise, we will never know. The avalanche-one hundred yards long, ten yards wide, and five feet deep-was upon him before he knew it. He must have made valiant last efforts to escape it, but Felzien was dead. Seven rescue workers found his body not completely covered by snow. Eerily, his mother had dreamed only two nights earlier that her son would be killed in an avalanche. 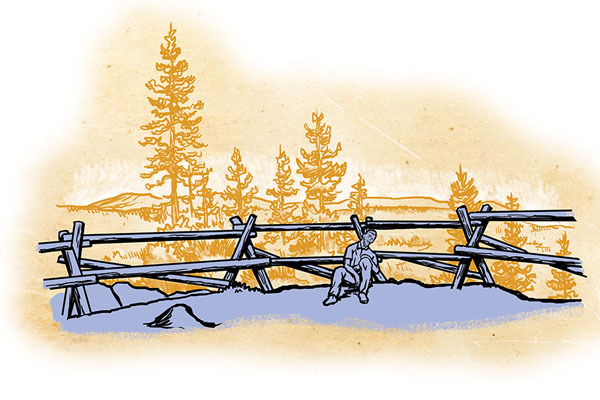 In 1885, U.S. Geological survey parties were exploring the park. On september 5, one party put out into yellowstone lake in an old sailboat. The group of four set sail on an unusually warm day. M.D. Scott took the seat near the mast to handle the oars, while one man sat in the bow managing the sail and two other men sat in the stern. The sun was out and no threatening clouds were present. Suddenly, the party back on the beach heard a crashing thunderclap that stampeded their horses. The four men in the boat were rendered unconscious by a bolt of lightning that knocked down the mast of their boat. One man gradually awoke, and looking around, saw that scott was bent over his knees dead; the "bolt from the blue" had struck him in the head, causing a long burn mark. 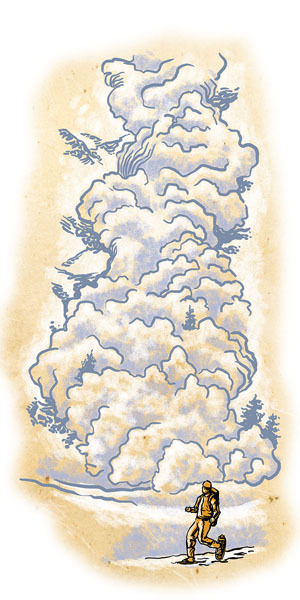 a long, dark streak ran the entire length of scott's body, showing where the lightning had run, and a hole in the bottom of the boat showed where it had exited the craft. Fortunately, the boat was close to shore and drifted in. On June 21, 2005, an incident at Old Faithful was particularly dramatic because it involved so many people. More than two hundred park visitors had gatherered that day around 3:15pm to watch an impending eruption of the famous geyser, when a “very intense, fast-moving storm cell” suddenly rolled in. Lightning struck about 15 yards in front of the famous geyser’s boardwalk, causing pandemonium in the crowd. A 12-year-old from Tennessee was the most seriously injured, but 10 other people were hurt. On June 26, 1939, three Bureau of Public Roads employees were driven to a worksite at the bridge across the Yellowstone River just east of Tower Junction. They were Bill Nelson, 20, Vaughn Roley, 21, and Earl Johnson, 18. They were to perform some work in a 26-foot deep pit. The Bureau of Public Roads routinely dug these types of holes to accrue information about ground formations before building roads and bridges. Johnson and Nelson lowered Roley in a bucket into the test pit. Roley noticed a slight sulfur odor when he was about eight feet from the bottom, but rode on down and got out of the bucket. At that point, hydrogen sulfide gas began to cut his throat and lungs and haze his vision, so he got back in the bucket and called for the other two men to pull him up. Suddenly, Roley lost consciousness. He fell out of the bucket, leaving only his feet in it. Nelson immediately began sliding down the rope in an attempt to get Roley back in the bucket. But partway down the rope, Nelson, too, was overcome by the gas and fell to the bottom of the hole. Johnson began to operate the hoist. Seeing that Roley’s feet were still in the bucket, Johnson pulled him to the surface. He saw a terrible yellow foam coming out of Roley’s mouth and nostrils. When Roley regained consciousness, Johnson ran to the Tower ranger station for help. While Johnson was away, Roley again lost and regained consciousness. Then he attempted to use the rope hoist as a lasso, trying to catch Nelson by his feet or hands in order to lift him to the surface. Johnson returned with help, and finally, holding his breath, Roley was lowered into the pit by a rope tied around his chest. He was forced to take a breath at the bottom of the pit and immediately felt himself blacking out. 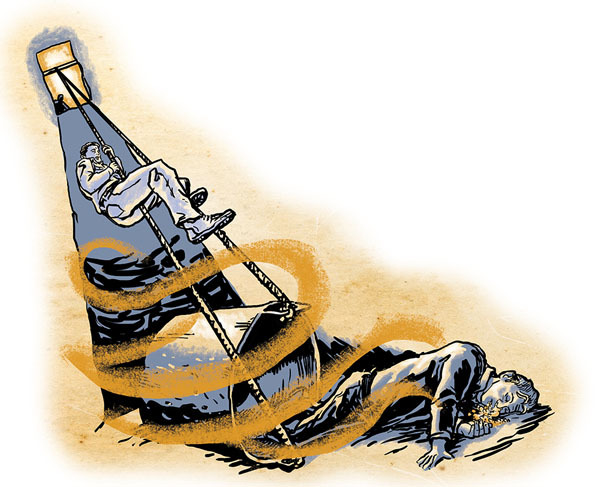 But Roley was able to slip the hoist rope around Nelson’s foot before the gas caused him to lose consciousness. When both men were pulled to the surface, Johnson saw the same hideous yellow foam coming out of Nelson’s nose and mouth, and fresh foam coming out of Roley. Both men were taken to the hospital. Roley survived, but Nelson died the following day. About two in the morning, the Bauers were awakened by waves of nausea and vomiting, which made them so sick they stayed indoors until the next night. Mrs. Bauer was practically a “raving maniac” until four in the morning, vomiting continually and having convulsions just before daylight. 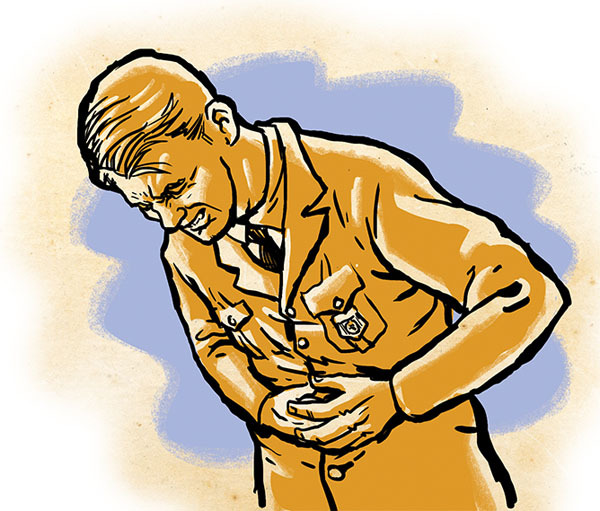 Mr. Bauer was intensly sick to his stomach but could not vomit. It was Phillips’s habit to come to the Bauer’s home each night to talk and listen to the radio. On the night of the 12th, Bauer wondered why he had heard nothing from Phillips, so he crossed the several hundred yards of deep snow to the ranger station. He found the building dark and cold and Ranger Phillips dead on the kitchen floor. Bauer immediately laid the blame for their illness on the roots they had eaten. Why Phillips did not call them during the night was not known, unless it was because the poison acted too quickly. A hot spring at Norris Geyser Basin was named for him as Phillips Cauldron.